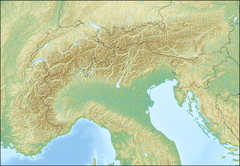 The FIS Alpine World Ski Championships 1987 were held in Crans-Montana, Switzerland, from 27 January to 8 February 1987. The alpine world championships included Super-G for the first time; it was first run on the World Cup level four seasons earlier, in December 1982. The Swiss skiers won 8 gold medals out of 10. ^ "Skiing: Downhill". Eugene Register-Guard. (Oregon). February 1, 1987. p. 8E.